I used to be a pretty lazy nail painter, I'll admit it. I have always loved having nicely paint my nails but hate spending time creating the perfect manicure, only to have it smudged a second later. There is nothing more frustrating than looking down at your beautiful essie laden finger tips only to notice that one (or two.. or three) of your newly painted nails have been ruined by a quick swipe through the hair or an itch of the face. I've been using this stuff for about two years now and man does it work! Being impatient, I tend to paint this directly over freshly painted tips (although it does say to wait one minute on the bottle) and seconds later my manicure is dry to the touch. This top coat adds an amazing shine to the nails that I love, as well as reducing the likelihood of smudges. Days when i'm feeling less lazy, I like to also use this as a base coat to protect my nails. While the polish isn't sold as a basecoat, it works perfectly for me and stops my nailbeds from staining while also saving me from forking out more money on another product that will do the same job. 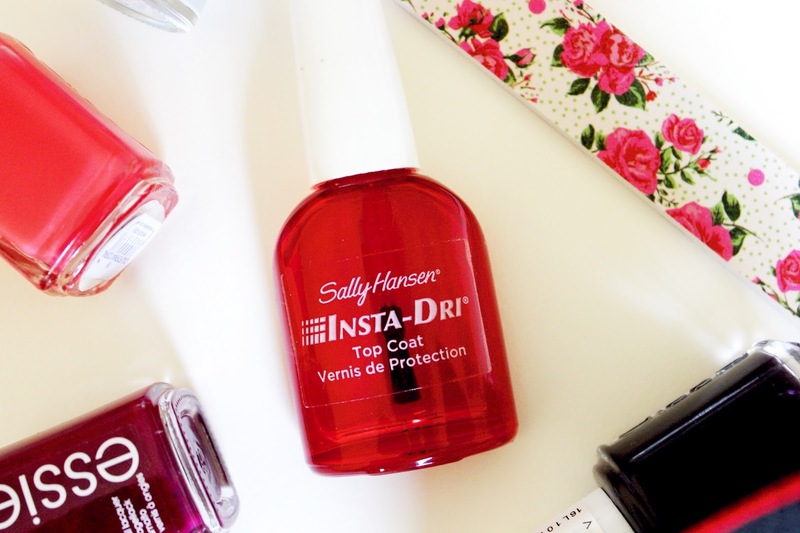 I am always getting compliments on my nail painting skills, but really I owe it all to this trusty topcoat. If you haven't tried this yet, I highly recommend giving it a go and see for yourself the difference it can make!